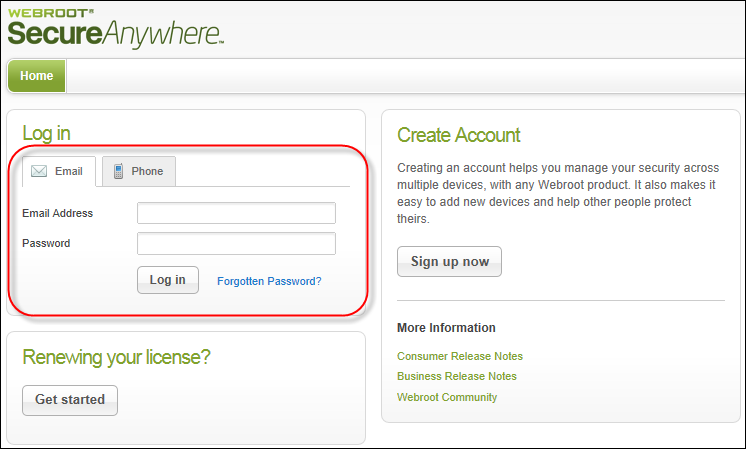 After you create an account (see Creating a Webroot account), you can log in to the Management Portal. On your first login, a Setup Wizard opens to help you begin configuration. Open a browser and go to the SecureAnywhere website: https://my.webrootanywhere.com. 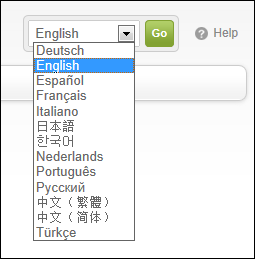 To display a language other than English, click the drop-down arrow in the upper right corner of the page, select a language, then click Go. Be aware that to enable languages that use double-byte character sets, you must have the appropriate language pack installed on your computer. In the Log in panel, enter the email address and password you specified when you created an account. After the third time you have attempted to log in and failed, the system sends you an email message, containing a link for resetting your password or security code. "Unfortunately you have exceeded the maximum number of attempts to access this console. You may try to access this console after 15 minutes. If you have forgotten your account details, please visit https://my.webrootanywhere.com and use the Forgotten Password link." If you forget your password or security code, click the Forgotten Password link, then click I forgot my password or I forgot my security code. 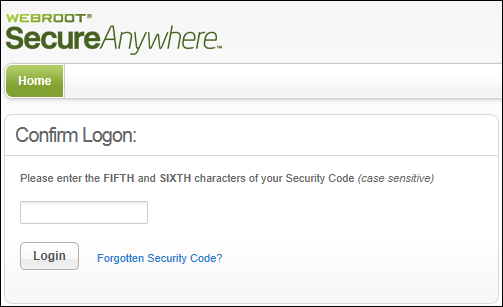 This personal security code was defined when you created a Webroot account. Every time you log in, Endpoint Protection will require this extra security step. Be aware that it prompts for two random characters of your code. For example, if your code is 123456 and it prompts you for the fourth and sixth characters, you would enter 4 and 6. When the SecureAnywhere website opens, click Go to Endpoint Protection. Note: If you also purchased Mobile Protection, you will have access to the portal for Mobile Protection as well; otherwise, you will not see the Mobile Protection panel. For more information, see the WSA Business - Mobile Protection Admin Guide. The first time you log in, the Setup Wizard opens. Continue with the next section to select a default policy. The Setup Wizard prompts you to select a default policy for new SecureAnywhere installations on Windows endpoints. A policy defines the SecureAnywhere settings, including how the program scans for threats and manages detected items. Recommended Defaults. Provides our recommended security, with threats automatically removed and quarantined. Recommended Server Defaults. Provides our recommended security for servers, with threats automatically removed and quarantined, while also allowing the servers to run with optimal performance. Silent Audit. Scans for threats without user interaction. Does not block or quarantine detected items. This policy allows you to review SecureAnywhere's threat detections first, so you can review detected items and add overrides for any legitimate application files. Use this policy if you are concerned about a false positive being detected or you are applying SecureAnywhere to a critical server. This policy is helpful if you want to preconfigure overrides before applying a stricter policy that will automatically remediate detected items. For more information about overrides, see Applying overrides from the Overrides tab. Unmanaged. Provides our recommended security, while also allowing users to change their own SecureAnywhere settings on their endpoints. Unmanaged endpoints still report into the Management Portal and show scan results. Administrators can also send them commands, but cannot change the policy settings. Note: If you are not sure which policy to select, the Recommended Defaults policy is a good starting point for protecting endpoints immediately. You can easily change the default policy later, as described in Selecting a new default policy, or create your own policies and assign them to groups of endpoints, as described in Creating policies. Open the drop-down menu and select one of policies. 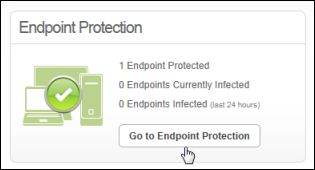 The Endpoint Protection status page opens, showing a Welcome panel on the top, deployment options on the bottom, and Support resources on the right. Continue with the next section to select a deployment method. The Welcome panel describes methods of deploying the SecureAnywhere program to endpoints. Note: These deployment methods are only available for Windows computers. If you need to install on Mac computers, see Deploying SecureAnywhere to endpoints and follow the instructions for using the SecureAnywhere Mac installer. If you have a small network, less than 100 endpoints, you may want to use the quick method described in the How to get started panel. Follow the instructions provided. If you have a large network and use Active Directory, we recommend that you click Deploying Webroot SecureAnywhere at the bottom to learn more about advanced deployment options. See also Deploying SecureAnywhere to endpoints. Note: If you close out of the Welcome panel, you can view the keycode and deployment information again by clicking the Resources tab. To get started, we recommend that you deploy SecureAnywhere to at least one test endpoint so you can see its status in the Management Portal. Look for your keycode in the How to get started panel. This keycode identifies your Endpoint Protection license. Download the SecureAnywhere installer file by clicking the Download link. From the endpoint, run the installer file. When the following Installation panel appears, enter your Endpoint Protection keycode and click Agree and Install. 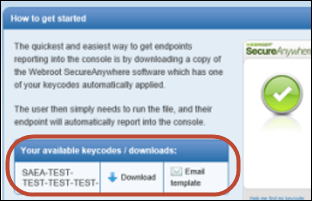 Alternatively, you can send a test email to an end user who will install SecureAnywhere. To do this, click the Email template link from the Welcome panel or Resources tab, and then cut and paste the text into an email message. The link automatically adds the correct keycode for the user. Next, the user clicks the link to begin installation. The program installs silently in the background, with the correct keycode already entered. When it's done, a Webroot icon appears in the endpoint's system tray. Wait for SecureAnywhere to finish its first scan. This should only take a few minutes. 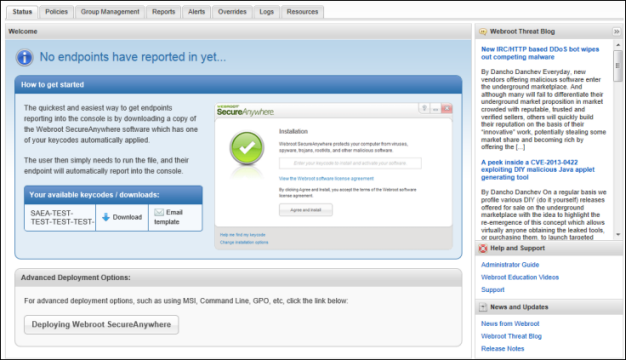 When it's done, SecureAnywhere reports into the Management Portal. After the endpoint finishes a scan, log in to the SecureAnywhere website again and see its status. When you click Go to Endpoint Protection, the Management Portal opens; you won't see the Setup Wizard again. See Using the Management Portal.